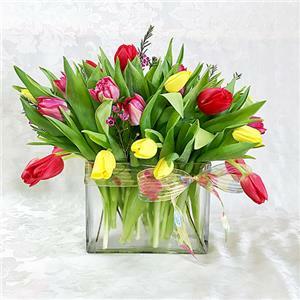 Welcome the feeling of Spring into your home with this gorgeous bouquet of 30 mixed color tulips.This colorful arrangement is designed in a clear rectangular glass vase that shows them off beautifully. It's the perfect bouquet for any tulip lover and a great choice to celebrate any occasion! Colors may vary according to availability from our growers.